Central Jakarta KUKMP Sub-dept. 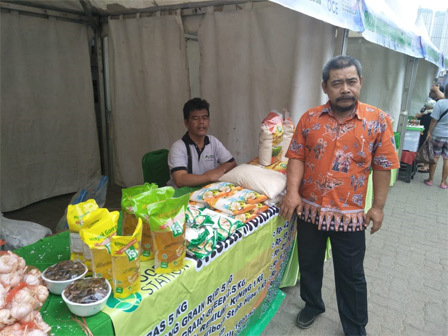 today is holding bazaar for traders under OK OCE at Petamburan RPTRA, Tanah Abang Sub-district, Central Jakarta.
" It is participated by 30 new entrepreneurs under OK OCE entrepreneurship training"
"It is participated by 30 new entrepreneurs under OK OCE entrepreneurship training," expressed Bangun Richard, Head of Central Jakarta KUKMP Sub-dept., Thursday (5/17). According to him, it has been held since May 15-June 8, 2018 in each sub-district. Those participants are traders of culinary, takjil, as well as jajanan kering and basah (traditional Indonesian cakes). "It's time they dare to market their processed products, we facilitate them with place and its ingredients," he stated. Meanwhile, Lena (39), a dried cake trader admitted she is grateful to join this program. Moreover, she got the knowledge how to package and market her products. "After getting the knowledge of the training, hopefully my business goes smooth ," she admitted.